Subsurface Aeration is the most effective way to aerate large natural ponds. A subsurface aeration system not only increases oxygen levels in your pond, it also helps to greatly reduces organic matter and sludge buildup on the bottom – reducing nutrients, algae blooms and aquatic weeds. To learn more about the benefits of pond aeration, see our Aeration – The Key to a clear Natural Pond page to see how aeration can improve your pond. If you would like to have an aeration system installed in your pond, visit our Large Pond Maintenance & Installation Services page for more information. First, let’s get to know what makes up an aeration system. There are 3 main components of a subsurface aeration system. 1. Compressor – is heart of the system, it is a pump that produces compressed air that is delivered to the bottom of the pond. Compressors are usually placed on the shore, near the pond, however they can also be placed several hundred feet away from the pond. 2. Tubing – the airline tubing carries the air produced by the compressor down to the bottom of the pond. The 2 most common types of tubing are Vinyl and PVC. Vinyl tubing is thin walled and floats when the compressor is operating, weights must be attached to it to keep it submerged. PVC tubing has a much thicker wall and is naturally self-weighted. It will remain on the bottom at all times by itself, and it is also more durable and longer lasting. If you are planning to install an aeration system in your pond, there are 3 important attributes of your pond that you need to consider to properly size the system. Often, the most overlooked factor to consider when installing a subsurface aerator is the depth of your pond. When considering an aeration system, ponds can basically be divided into 2 categories – shallow ponds and deep ponds. Shallow Ponds – Ponds 6’ / 1.83 m and under are considered shallow ponds. In ponds that are 6’ deep or less, Shallow Pond aeration systems are the best choice. Linear diaphragm and linear piston compressors are the 2 types of compressors typically used in shallow ponds. These compressors are energy efficient, reliable and produce large volumes of air, but they only work in a pond with a maximum depth of 6’ to 7’. Deep Ponds – Ponds over 6’ / 1.83 m deep fall into the deep pond category. At depths greater than 6’ / 1.83 m., there are 2 excellent options available. The most popular type are Rocking Piston compressors. They are very powerful, economical produce ample air flow and operate best at depths from 7’ to 50’. Rotary Vane compressors are becoming more popular for use in intermediate depth ponds from 5’ / 1.5 m to 16‘ / 4.9 m deep. These compressors are produce higher volumes of compared to Rocking Piston compressors, however they can’t be used very deep ponds and are more expensive. How Does Depth Affect Circulation? The amount of circulation an aeration system creates is directly related to the depth of the pond. The deeper the pond, the more circulation is created. The circulation is created by the rising air bubbles produced by the aeration system. As these bubble rise from the diffuser at the bottom of the pond, they pull water along with them to the surface. In deeper ponds, the bubbles must rise a greater distance to reach the surface creating more ‘pull’. The deeper the pond, the more water the bubbles can pull along with them. Here is an example of how depth affects aeration. Let’s see how effective a ¼ HP Aeration System is in two different ponds. The diagram below illustrates how depth affects the effectiveness of aeration. For example – A ¼ HP Aeration System can effectively aerate a ¼ acre round pond that is 8’ deep. However, this same system can aerate a much larger pond if it is deeper. If the pond is 16’ deep, this same ¼ HP Aeration System can aerate a 1 acre pond! The shape of your pond also greatly influences the size and design of the aeration system. Round or circular shaped ponds naturally lend themselves to effective aeration. Usually, 1 diffuser placed in the center of a round pond will provide sufficient aeration. The bubbles rising from the diffuser produce a circular pattern once they spread out at the surface of the pond, creating ripples that radiate out to the edges of the pond. On the other hand, long, narrow ponds, or irregular shaped ponds often require 2 or more diffusers to effectively circulate the water in all areas of the pond. In the diagram below, the dotted circles represents the area that 1 diffuser will effective aerate. The circular shaped pond (figure 1) has 1 diffuser placed in the center of the pond, which essentially covers most of the pond. 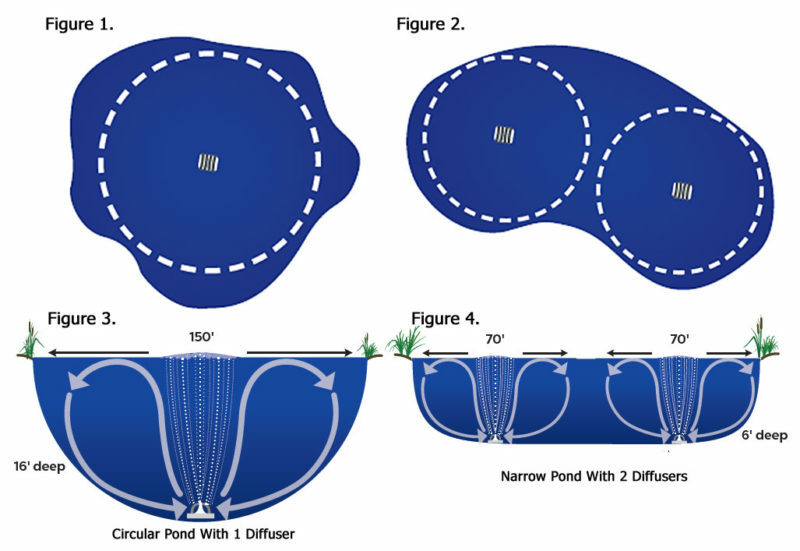 The long, narrow pond (figure 2), needs 2 diffusers placed strategically in the pond to maximize their effectiveness. The surface area or size of a pond is directly related to the size of the aeration system needed to properly aerate the pond. Simply put, if depth and shape are the same, a larger pond will need a larger compressor that produces more air to power multiple diffusers. If you know the approximate dimensions of your pond, use our handy calculator to determine the surface area and volume. Now that you have better understanding of what subsurface aeration systems are and how they work, you can take this information along with the measurements of your pond to determine what type and size aeration system is best for you. 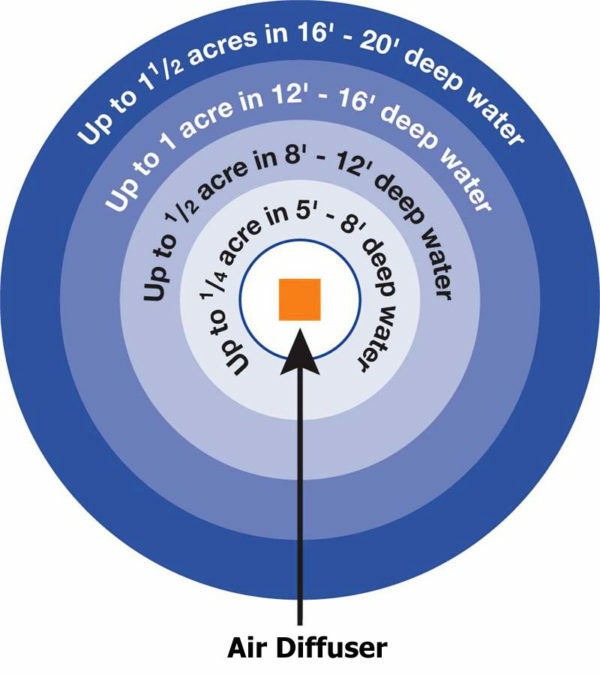 Circular ponds are the easiest to assess, however, even if your pond isn’t perfectly round, and is more square shaped, you can still use the chart below. You can use the chart below to determine the correct system for this pond. Find the depth of this pond along the top row (16’). Under the 16’ Coverage column, move down until you find the surface area of this pond – .41 acres. If you don’t find the exact size, always go to the next larger size – in this case – ½ acre. 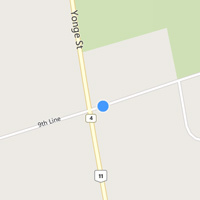 Move to the right along the ½ acre row to the first column. For this pond a DWA100 system will effectively aerate this pond. If you have a circular (or near circular) pond, use the chart below to determine the correct size aeration system for your pond. First, find the depth and surface area of your pond to determine the aeration system you will need. If you don’t see the exact depth or surface area of your pond – move to the next larger column or row. You will see that a 1 acre pond, that is 12’ deep would require a DWA300 aeration system. A ½ acre pond that is 6’ deep would require a SWA400 aeration system. 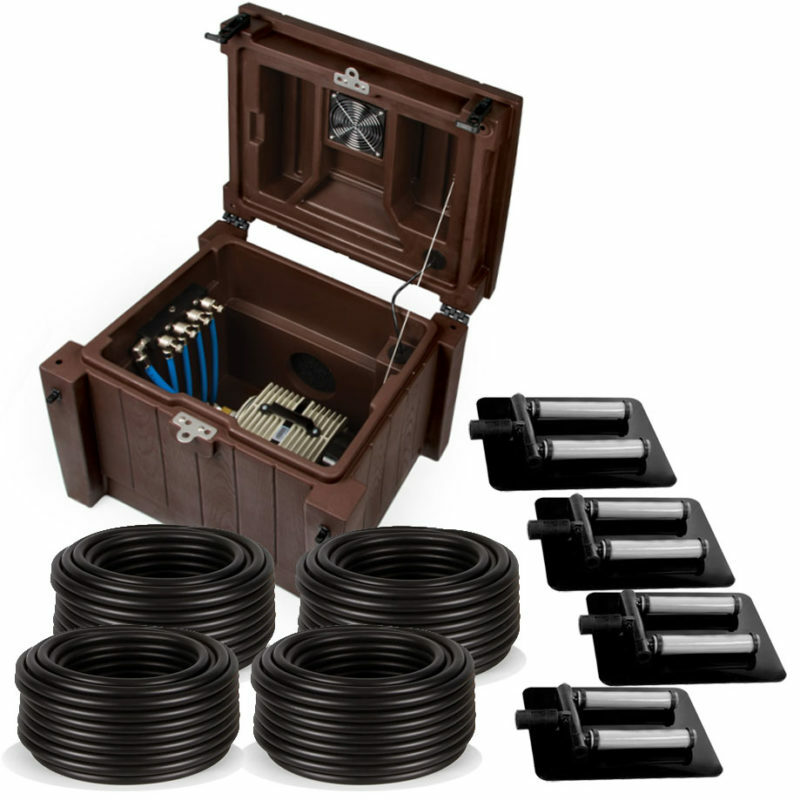 To see an aeration system that is right for your pond see our Lake & Large Pond Aerators page. To properly size an aeration system for irregular shaped ponds, it is often easiest to divide the pond up into smaller sections, take measurements and calculate what is needed for each section. Then find an aeration system with multiple diffusers to aerate each section. Using the satellite image and scale on Google Maps can make determining the size of your pond easier. 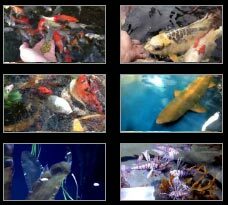 We offer quality products at great prices for your pond.